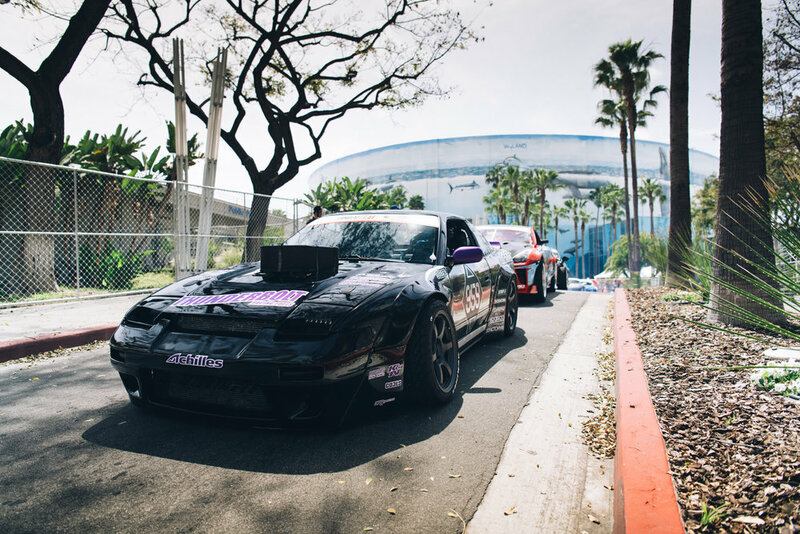 Formula Drift made its 2018 debut in Long Beach, California last weekend. Round 1 of the 8 part series takes place on the Long Beach Grand Prix race track. Coffman Racing arrived at the event ready to shred. In the off season, the team made some subtle changes. The race car wears a fresh livery, designed for the 5th year in a row by the talented Factory83. The car was fully rebuilt in the off season and is ready for another year of battle. Our crew is all new as well. We were able to recruit a few talented mechanics that spent the past few years working on rally car teams. We also have a new crew chief and spotter this season that is very experienced with professional drifting. We are confident this is the best version of our team to date. The team assembled early for a few days of preseason shake down at Willow Springs International Raceway. During testing, we were able to make the notes and adjustments necessary for this season. Big thanks to Achilles Tire for providing us with the necessary rubber to make this sort of extensive testing possible. For the first time, we were able to attend Formula Drift’s Media day, a day of ride alongs and practice runs in the name of journalism and publicity. In the four driving sessions, Matt was able to make practice runs while the team was able to get data for this weekend's competition. Friday, after a quick practice session, the team was ready for qualifying. On Matt's first qualifying run, one of the cars exhaust hangers broke creating a noisy commotion under the car as Matt powered through the course. The run was scored a 66. The car was quickly repaired and Matt's 2nd qualifying run was spectacular. The judges awarded it an 86, which resulted in a qualifying position of 16th. Saturday was the main competition. Our qualifying score matched us against Formula Drift veteran Ken Gushi for Top 32. Both Ken and Matt put on an excellent show, and drove with great commitment and proximity. The fans loved it. The judges unanimously awarded Matt the win, and we moved onto the Top 16. In the Top 16, Matt faced the number 1 qualifier Piotr Wiecek. Together they put on one of the most intense battles of the weekend, both drivers driving their best, neither making any mistakes. The judges unanimously voted for a one more time battle, where Piotr was awarded the win. While the team was bummed their weekend had come to an end, everyone was very proud of what we had accomplished and the good memories that had been created. The team would also like to formally congratulate Piotr, who went on to take 3rd place in the event.